Working in coloured pencil and graphite, planning a future painting. I don't normally like working from photos but I've wanted to do some paintings of Clovelly for some time. I took lots of photos when we were there on a misty day - it was very moody and atmospheric and it really suited the village which is built with rocks from the beach, the incredibly steep streets cobbled with smaller rocks. Normally I wouldn't go for this 'every stone' approach but the stones are so chunky and so important to the image that I thought I would. Charcoal with coloured pencil for another, better version, much larger? - the underlying grey would be really suitable. Or a canvas? again I could do a grisaille before adding subtle touches of colour? You have another never ending source of pictures with this set of photos. 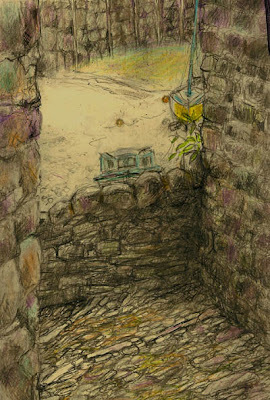 I didn't notice the harbour in the pencil picture - I was so into the stones and the detail of them. And yes - TIME - oh to have more of it. I did get a bit carried away with the stones!! In the painting the harbour would be more luminous against the grey of the stones (with subtle colours) and so would be more noticeable. There are several I'd like to work from but find it easier if I do a drawing first to free up a bit - then free up further in the painting, I don't like painting straight from photos.